Most rational people recognise that Islam is a religion, the second largest religion in Britain. Sky TV has chosen to overlook this obvious fact, and thus wasted a golden opportunity to greatly enhance community relations and social cohesion in the UK, by encouraging mutual understanding between followers of different religions. 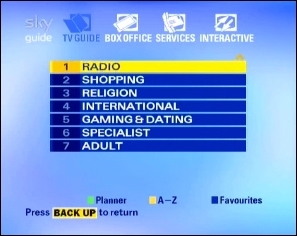 “Religion”, where viewers can move from one channel to another at the click of a button, but for reasons unknown to me, Sky has chosen to list “Islam Channel” with foreign language broadcasts under the heading “International”. The channel is based in the UK and broadcasts in English. It is run by British Muslims and Islam is clearly a religion, so why the channel is listed as foreign baffles me. Grouping channels together offers an easy way for people who are interested in religion to easily find programs that cater for them. If only those channels represented different religious communities, then Muslims watching Islam channels can easily switch and watch a Christian channel teaching Christianity, and therefore, attain knowledge on Christian beliefs and values directly from knowledgeable Christians, without the need for second hand learning. The same can be done by Christians, who can understand how Muslims interpret their religion and scriptures. This will surely enhance social cohesion, by allowing people to get information directly from the sources without the distortions and bias of many of the so called “experts” who often volunteer to teach faiths that they do not follow, and do not really understand. Whilst there are several American based channels bundled together in the religion category, UK based Islam Channel is absent from the list !. Islam is the second largest religion in the UK. According to the 2001 census, the number of Muslims in the UK is close to 1,6 Millions or 3% of the population. Around 12% of these are indigenous White people. I sincerely hope that Sky TV is not implying that Islam is a “foreign religion”. Such an old fashioned notion does not help in building bridges between the different faiths of the British people. Its best to to have Islam channels away from the false religion.